Etoile is a knight in the Lusitania army. 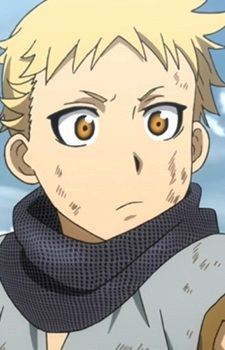 Etoile is actually a girl, who disguised herself as a boy, so she could go to war. In Hiromu Arakawa's version of the story she was captured after a war between Pars and Lusitania and taken hostage as a slave. She later kidnaps Arslan, thinking he was just a spoiled rich kid, without realizing Arslan is actually the prince of Pars. She escapes in the first episode, almost being killed by an arrow that Daryun shot, but barely missed. Arslan and Etoile reunite after 3 years, Etoile becoming a page under lord Guiscard, the younger brother of Innocentius VII, the king of Lusitania. She was searching for her friends that were taken as slaves the same time she was, but finds out from Arslan that they were killed after Etoile escaped. After learning the fate of her friends, Etoile doesn't threaten Arslan, but instead gives him a Bible of Lustinia, and tells him that if he converts, she will welcome Arslan to the castle and even treat him to dinner.